1725 - Birth of American composer Jeremias Dencke. 1849 - Johann Strauss, Jr. took over the Vienna Strauss Orchestra after the death of his father, Johann Strauss, Sr.
1854 - Opening of NYC's Academy of Music at 14th Street and Irving Place. 1875 - Henri Fevier, French composer, was born in Paris. 1913 - Premiere of Elgar's symphonic poem Falstaff at Leeds Festival. 1929 - Kenneth Leighton, English composer, was born. 1933 - Phil Niblock, American minimalist composer, was born. 1943 - Nathaniel Dett, Canadian-born American composer, was born. 1948 - Leonard Bernstein began month-long concert series conducting the newly renamed Israel Philharmonic. 1960 - Premiere of Dimiti Shostakovich's String Quartet No. 8. Beethoven Quartet in Leningrad. 1976 - Tonight's The Night by Rod Stewart was released. 2001 - Premiere of Steve Heitzeg's Nobel Symphony. Gustavus Orchestra, soloists and choirs, conducted by Warren Friesen at Gustavus Adolpus College in St. Peter, MN. 2003 - Premiere of Thea Musgrave's Pontalba. Two Act Opera. Celebrating the 60th season of The New Orleans Opera, Robert Lyall, conducted. 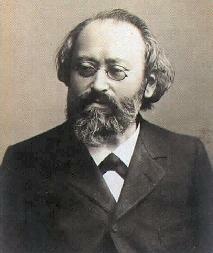 Composer Max Bruch died October 2, 1920. Bruch was born in Cologne, Germany, January 6, 1838. His mother was a famous singer, and was his first music teacher. He began his music studies on the piano. Bruch started composing early. By the time he was 14 he had already written more than 70 pieces. Bruch started composing early. By the time he was 14 he had already written more lthan 70 pieces. In 1852, he wrote a symphony and a string quartet. The quartet was such high quality that he won a four year scholarship from the Frankfurt-based Mozart Foundation. This enabled him to study with Ferdinand Breunung, Ferdinand Hiller, and Carl Reinecke. . He taught music and served as concertmaster in an orchestra for some years, then settled down to a life of composing, conducting, and occasional teaching. 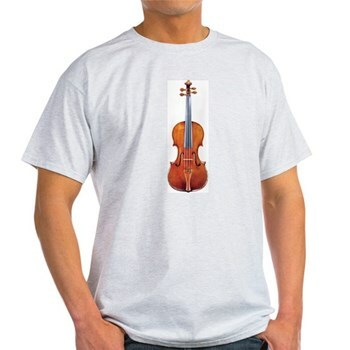 The famous Violin Concerto No. 1 in G Minor, Op. 26 is one of nine works Bruch composed for violin. The remaining works for violin include the Second and Third Concertos (both in D Minor), the Scottish Fantasy, Serenade, Konzertst�ck, In Memoriam, Romance, and Adagio Appassionato. "It is a damned difficult thing to do; between 1864 and 1868 I rewrote my concerto at least half a dozen times, and conferred with x violinists before it took the final form in which it is universally famous and played everywhere." Among the violinists Bruch consulted were Johann Naret-Koenig, concertmaster of the Mannheim symphony and the great soloist Ferdinand David. But the violinist who gave him the most help was undoubtedly Joseph Joachim. He publicly acknowledged the help, and even published Joachim's letters of advice. Ultimately the concerto was dedicated to him. 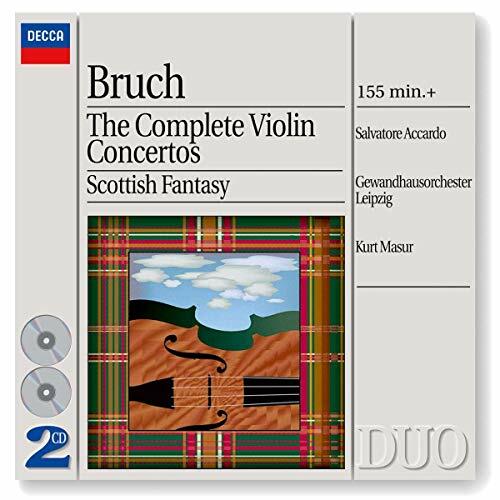 Bruch's other famous violin work was his Scottish Fantasy for Violin and Orchestra, Op. 46, or as it is properly titled, Fantasy for Violin with Orchestra and Harp, with the free use of Scottish Folk Melodies.Bruch composed his Scottish Fantasy in the winter of 1879-1880, and it was first performed in September 1880, with Pablo de Sarasate as soloist. The piece was dedicated to him. Bruch was invited to conduct the Liverpool Philharmonic Orchestra, and remained there for three seasons(1880 � 1883). In 1883 Bruch left Liverpool and became director of the Breslau (now Wroclaw, Poland) Orchesterverein, where he stayed through the end of the season in 1890. That autumn, Bruch took up an appointment as professor of composition at the Berlin Hochschule fur Musik, working there until his retirement in 1910 and retaining his rank as a professor there until his death in 1920. Johann Strauss, Sr did not want his son to become a musician, but Johann Stauss, Jr. dreamed of playing in front of an orchestra, like his father. Eventually Jr. became a musician and took over the job of leading his father's orchestra. Strauss Sr. was called "The Father of the Waltz," Can You Guess the nickname of Strauss Jr? "The violinist is that peculiarly human phenomenon distilled to a rare potency--half tiger, half poet." as a Bonus. Good Performances. Johann Strauss, Jr. became known as "The Waltz King."